An analysis of approximately 30 technical indicators using a back testing market performance analysis shows in studies that five indicators in particular out-perform the rest of the pack. Analyzing the crossover points of each of the top five indicators identifies fairly reliable signals for stock price uptrend and downtrend changes. 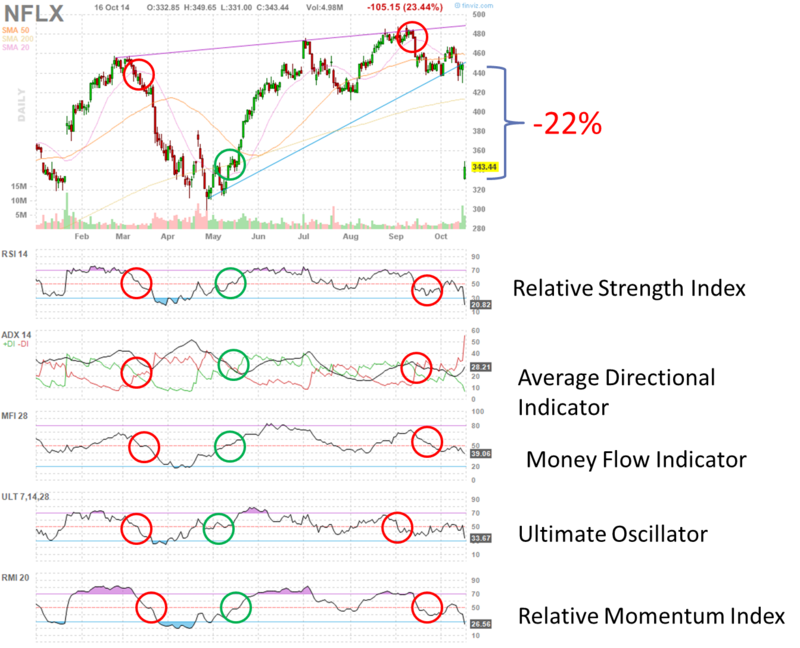 The red circles show points of down trend (sell) signals and the green circles show points of up trend (buy) signals. In these two examples, NFLX and GTAT show dramatic points of change corresponding to confirmations in signals across all five indicators. This technical trading method is used in combination with fundamental analysis and a review of the equity position of a firm to assess the magnitude of a directional change. Stocks that are issuing shares create dilution of the share price and stocks buying back shares correspondingly may generate higher share prices. The fundamental analysis and equity analysis will be discussed in a later post.